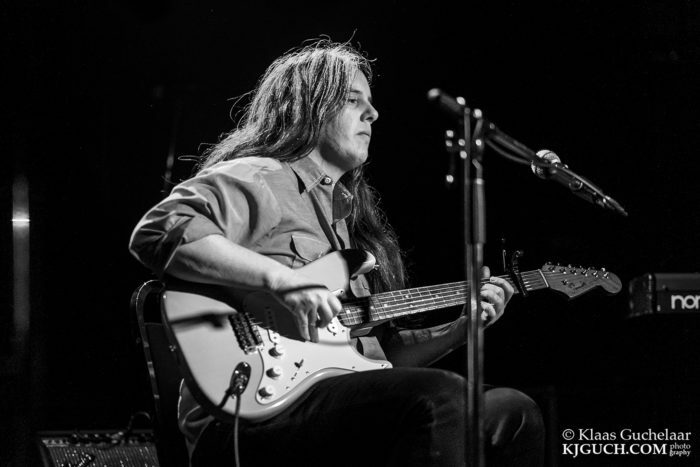 Marisa Anderson is a gifted musician who hails from Sonoma, California but currently calls Portland, Oregon home. Though somewhat under the radar, Anderson is renowned as one of the finest guitarists in the world. Emerging as a lively interpreter of Delta blues and Appalachian folk music, Anderson has been embraced by free and improvised music aficionados for the history of guitar styles and techniques that flow through her fingers. Her latest album is bolstered by electric piano, pedal and lap steel guitar and finds Anderson exploring the west, as it sits and as it stands in a contemporary, border conscious America. The record is called Into the Light and it’s one of the finest records of 2016. Marisa has been touring extensively since its release in July and she recently played Guelph so I invited her over to our home for pizza and a far-reaching conversation in our living room about her frequent visits to Guelph, playing Hamilton, Ontario and the Hamilton controversy and confusion, research and misinformation, bubbles, implied and overt threats, identity politics discourse, Patton Oswalt on nomenclature and content, broad brush finger-pointing, missed messaging and selective hearing, fear and outspokenness, communicating thoughts and ideas as an instrumentalist, spiritual and Christian music, church-y and state-y, growing up queer in a religious household, splintered identities, a childhood in Sonoma and wine country, working in the service industry, music and swimming, rebellion and recorder, getting into guitar, Bill Monroe, John Denver, Rush, Sousa marches, guitar reverence and understanding it as a shape-based instrument, Appalachian folklore and story songs, words and country sounds, Chet Atkins, guitar styles, sustainability, many sounds and one pair of hands, writing and singing at one point, “The House Carpenter/Demon Lover,” “Johnny I Hardly Knew Ye,” folk traditions and definitive versions, intangible histories and empirical art, instrumental music as “cinematic,” Into the Light as the soundtrack to a non-existent film about the concept of feeling or being alien and migration, border psychology, belonging, music as an idea and emotional processor, contextualizing mysteries, gentrification in Portland, Oregon, urban growth boundary, distance and fodder, new work, coming back to a new America after time away, the vote recount, local levels, an uprising of common decency, the song “He Is Without His Guns,” a happenstance recording, self-quality control, and then it was into the night. Tom Scharpling is a comedic writer, performer, and personality who hails from the state of New Jersey. He founded a fanzine and record label called 18 Wheeler in the early 1990s, he was a writer and executive producer on the TV show Monk during its eight year run on the USA network, he made contributions to the show, Tim and Eric Awesome Show, Great Job!, and has directed music videos and short films for people like the New Pornographers, Ted Leo, the Postal Service, and Aimee Mann among others. 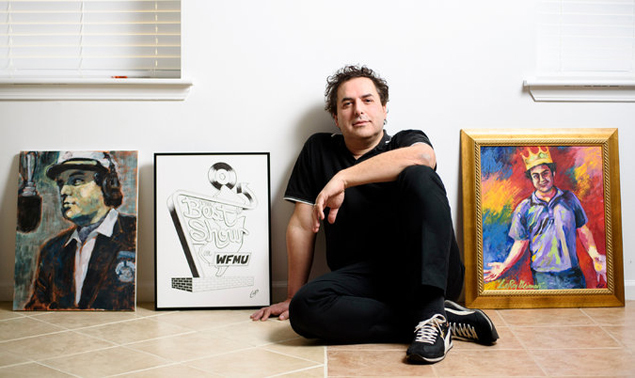 But along with Jon Wurster, Scharpling is most beloved as one-half of the comedy duo Scharpling & Wurster and for hosting the popular and influential call-in music program The Best Show on WFMU in Jersey City, New Jersey. Scharpling commandeered the Best Show for 13 years, before ending its run in December 2013. This past October, he announced that the Best Show would be returning as a podcast, which can soon be found at thebestshow.net, and the Numero Group is also releasing a 16-CD Scharpling & Wurster Best of the Best Show box set this coming March. Here, Tom and I discuss soggy New Jersey, getting over winter, the current status of The Best Show, why the original Best Show stopped, quality trumps all, volunteering at a non-commercial station like WFMU, no money, working real jobs while putting a lot of time and energy into a volunteer project, working for Monk, whether or not the consumption of free content means that content has been devalued, people value phones more than the entertainment they’re consuming, the elimination of singles and music industry mistakes, loving the things that people make, making a living, The Best Show will be less a podcast and more of a live-on-the-internet type show, no doubt, commercials, I convey envy for some reason, how the end of The Best Show on WFMU impacted people, growing up lower middle-class in New Jersey, getting into comedy and music at a young age, loving game changers like SCTV, SNL, David Letterman, Bill Murray, and Howard Stern, starting a zine and record label, writing a screenplay, performance anxiety, getting into WFMU as an overnight DJ, how other people’s work might influence your own, it wasn’t really the best show, when The Best Show and Scharpling and Wurster began to click, there’s no fun in fundraising, the best is yet to come, Julie Klausner’s How Was Your Week? and Marc Maron’s WTF, not listening to other people’s stuff when you start making stuff, calling upon independent podcast and radio hosts for interviews, perceptions of success, the Scharpling & Wurster box set is special, reflection, Patton Oswalt, Julie Klausner, Jake Fogelnest, Damian Abraham, and others contributed to the liner notes in the box, Tom and Jon each wrote descriptions of the tracks, Fucked Up rule, future plans and media appearances, Letterman, going to Late Night with Conan O’Brien tapings, whether or not Tom was at a taping of The Chris Getheard Show featuring Sleater-Kinney instead of doing Jon Solomon’s WPRB radio show, what the Best Show might look like, smashing a phone with hammers, the song “Sun Glass” by Fucked Up, and that’s the end. This week the Mich Vish Interracial Morning Show! is pleased to have two special guests on the program. Firstly, we welcome one of the most brilliant comedic minds of our time, Patton Oswalt back to the program at 7:15 AM EST. Then later, the great singer, songwriter, and musician Daniel Romano is back on the show at 8:05 AM EST. To learn more about these people, listening live, or downloading/streaming this show later, please visit this link for Patton, this one for Dan, or perhaps even this link to hear this and/or other recent episodes.